For Carol Cameron, awaking to the sounds of morning birdsong in San Luis de Monteverde, Costa Rica, is all part of the job. Meet UGA Costa Rica’s triple threat, Mavis Trejos. Chef, mother, and businesswoman, Mavis can do it all. Making empanadas as easy as one, two, three steps. As we celebrate the 10-year anniversary of UGA Costa Rica (UGACR) offering education abroad programs, what better way to reflect on the great decade than to speak with those who have been at the UGACR campus since day one. We spoke to San Luis native Mario Pérez. With his infectious smile and caring nature, Mario is truly an essential part of the hardworking team that is Mantenimiento, or Maintenance. I try not to drink that much coffee. I will probably drink about 8 cups a day. Having a passion for something is wonderful. But what’s even better is sharing that same passion with others. During the month of May, I spent numerous hours sharing my creative space with the UGACR Advanced Spanish and Photodocumentary Maymester program. Let me start with this: I could have easily confused my workspace with that of a bustling news room. Not only were the students’ pieces constantly expanding, undergoing edits and reshoots, but also the students themselves maintained an amount of motivation and energy throughout the course that could be applauded. Better yet, as their interviews and stories came together, capturing the inexplicable inner beauty of the people who make UGACR the unforgettable community that it is, it became clear that their final products would wonderfully reflect the goals of the Humans of UGACR project. Thanks to the students’ inventive spirits, Humans of UGACR has grown a little more. Enjoy today’s addition! As it is with a number of developing projects, Humans of San Luis is undergoing some changes – and we want to keep you updated. Because the objective of this photo series is to focus on a range of subjects, from tourists to students to locals, we believe a more appropriate, all-encompassing name for the project would be Humans of UGACR. The intention of Humans of UGACR was, and continues to be, to share the thoughts (epiphanies even), that come from people visiting, working, and living within the community surrounding the University of Georgia Costa Rica campus here in San Luis, Monteverde. 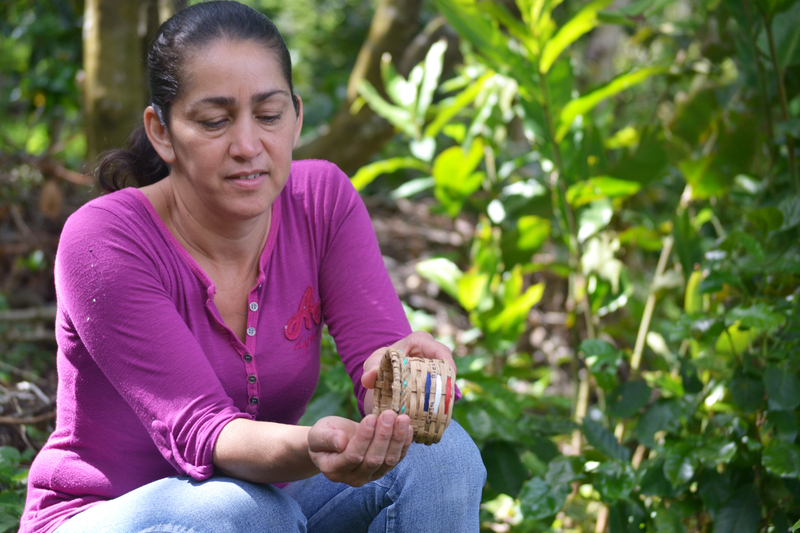 Today, we meet Elisa Mata Leitón, a local coffee farmer who takes time from her gardening and craft-making to weave tour groups through her hillside of coffee plants, banana trees, and root vegetables, informing them of her organic coffee and sugarcane growing processes. Elisa spills coffee beans into her hands, discussing the natural bean-drying process, which typically takes up to 22 days in the misty Monteverde cloud forest. How do you feel about your farm being organic? I feel good because we know that what we are eating and producing isn’t contaminated, for us and for other people. Why do you enjoy giving tours? I like to communicate with people even though I don’t speak English, but I like to share with others. It is also a way to provide a bit of income for my family. When Alvaro was well he also used to help me with the tours, but lately it’s almost always me. But I like it. Do you remember your favorite things that tourists have said to you? People say that I give a very nice tour and they enjoy being here and extracting [the juice from] the sugar cane. Also [they say] that I am very fortunate to live in such a place with a beautiful view. I like San Luis, I like it here because we have peace and tranquility. If we live in the cities there are many people, a lot of noise and I don’t like this. I like living here.